Kid #1, as readers of this blog know well, has long had an infatuation with Roman emperors. At one time I worried because he seemed drawn to the most unsavory of them (Nero, Caligula). And I've always suspected that his pretending to be Brutus and stabbing an unexpecting Julius Caesar (yours truly) has something Oedipal underneath it. But his most recent classical hero is Augustus Caesar, and it is hard not to approve -- even if "Emperor" has now become this child's career goal. 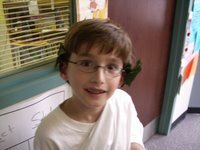 Nonetheless I did promise Kid #1 that if he did a good job impersonating Augustus for the Third Grade Wax Museum, then I would publish his little essay on this blog. So here it is. One note: my son attends a "Community of Caring" school. That means little details that he would have liked to have included had to be left out -- like the fact that Augustus had Caesarion (Julius Caesar's child by Cleopatra) slain in Egypt because he considered the guy a potential rival. Personally I think murdering your rivals demonstrates determination and possibly enthusiasm -- and those qualities are certainly part of a Community of Caring. But that's just me. I chose Augustus Caesar, the famous first emperor of Rome. He is famous because he kept the longest peace known for the Roman empire. I chose him because I think there should be more world peace. He was born as Gaius Octavius on September 23, 63 B.C. in Rome. His mother was the niece of Julius Caesar and Caesar adopted him because he didn't have any children of his own. Octavius was only 19 when Julius Caesar was assassinated. After Julius Caesar was killed in the Senate, Octavius fought 5 civil wars to kill all the assassins. When he conquered Egypt, he made his enemy Marc Antony commit suicide. He was always challenged by rivals. It was probably hard to rule the vast Roman empire, too. Augustus was famous for forty years of civil peace and growth of wealth. He made many temples and buildings, and made laws forbidding robberies. He gave money to poets and artists. Romans loved him for keeping peace and giving them food and entertainment. Octavius changed his name to Caesar in memory of Julius Caesar. He was called "Augustus" by the Senate because it meant the exalted. Augustus died when he was 76 in Rome in A.D. 14. After his death he was made a god. Augustus was peace loving. He showed perseverance by not giving up when he destroyed the assassins of Julius Caesar. Also, he had discipline because he fought in wars and ruled a very big empire. He wasn't greedy for power because he refused many powerful jobs when he was young. He believed in justice because he made laws, kept peace, made many temples and was the first and best Roman emperor. All the other emperors didn't keep the empire in peace so long. Augustus inspires me because he is great and I don't find many politicians who are as good at changing the world as he was. He served his people. Augustus was honest, trustworthy, and determined. You ought to get your son a coffee mug from a Cafe Nero in the UK. Personally, I want to start a rival coffee joint called Cafe Caligula, but one suspects that the UK coffee market is already glutted. I haven't been reading your blog long enough to know if this is sarcasm. I rather hope so. Ahhh, so that's why kid #1 is learning to play the fiddle, and I'm no lyre. JKW: Imagine the inventive uniforms that employees of Cafe Caligula could be compelled to wear. Anonymous: I am never sarcastic, nor ironic. Except at this moment. J/E: Kai su teknon? All Greek to me. I asked Kid #1 to consider using BCE and CE rather than AD and BC. He thought about it for a while and chose the latter. By the way, he won't be playing a fiddle as Washington burns, but he may be pounding at the piano. He's grown up quite a bit since I last saw him. Looks just like you too, but you probably knew that already. Might pick up a copy of The Spectral Jew for the hell of it. Based on everything you've written about it, it sounds like something I could have used on the Merchant of Venice paper I wrote last fall. Lindsay: he is much much much much much cuter than I ever was. And hlod off buying Spectral Jew: I'll be posting a review of it today or tomorrow.